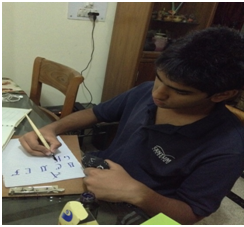 Calligraphy seems like a lost art these days but for Udeept Bhatnagar, Gold Award participant from Delhi Public School Gurgaon, it was all he wanted to learn and build upon. 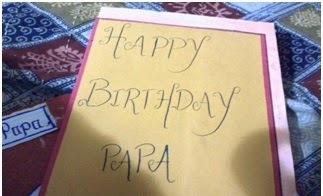 I first found out about calligraphy when I saw my cousin decorate a greeting card, to me that card was the single most beautiful thing I had ever be held in my life. I then became curious about calligraphy and only got an opportunity to learn this art when I became a part of the Award Programme and opted for calligraphy as my skill. I asked my parents to obtain for me a calligraphy set. This desire of mine was promptly fulfilled by my parents. The next step was to actually learn the art of calligraphy and build my skills to a level where I would be able to use calligraphy effectively in everyday life. I sought the guidance of my uncle, who I knew held an interest in such matters. His penmanship, bolstered by the art of calligraphy, was exquisite. This led to my association with the broad tip pen and a bottle of ink. I knew that this was one journey I would like as much as my destination, which was that of being the best I could be at this unique form of visual art. In the beginning my instructions were clear, crisp and concise. The duration of lessons too, was short. I was simply asked to make different strokes on a plain white sheet, but as I progressed from a beginner to a novice, the lessons and instructions both became harder and more elaborate. The effort put into each class seemed too much in proportion to the time I was spending. It is often said that hindsight is perfect. I can completely relate to this upon looking at the results all that effort has yielded. Soon enough, I was faced with a deceptively easy decision. I use the words deceptively easy because I wasn’t aware of the various different consequences of my choice. The choice faced by me was which writing style to pursue, study and practice in order to be an expert at it. I chose to learn the ‘Gothic Style’. On my 12th birthday I received a book on calligraphy as a gesture of encouragement from my parents. This book became my Holy Grail and nearly all of my free time was spent trying different techniques and methods that I studied in this marvelous volume.. The person who inspired me to keep on learning and practicing was my father who convinced me and motivated me no matter what. Besides helping me become more creative calligraphy has helped me increase my concentration as well as hone my creative abilities. The Award Programme has helped me get recognition in my class for the art of calligraphy, and I am forever grateful for getting the opportunity to pursue something I am passionate about and hone my skill.